I’m pleased to announce that “Lemuria Book 1” is now available in English for the first time ever! This is the first collection of short stories by Karl Hans Strobl to have ever been translated into the English language. 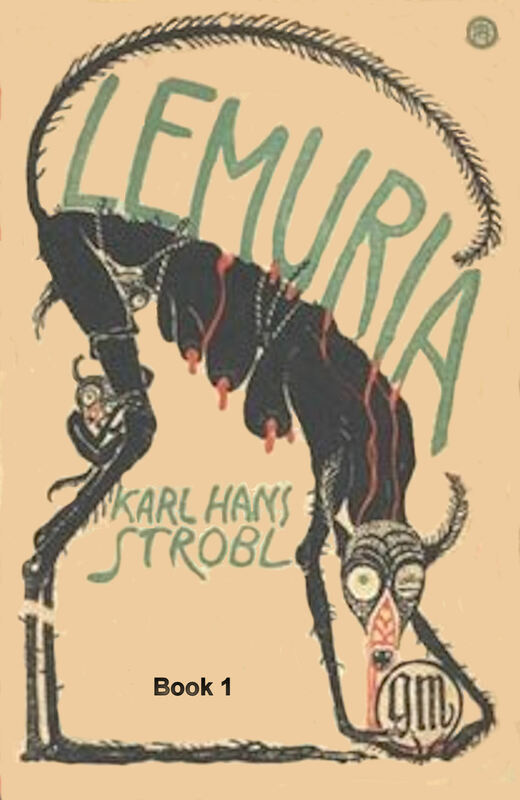 Karl Hans Strobl was noted for his short fiction, particularly his dark fantasy fiction and “Lemuria” collects some of his finest stories. You can sense his passion and zest for living in these pages. These stories come at a time when “Steam Punk” is popular. His stories fit into this genre quite well and it is astonishing how modern and readable these fantastic stories are. As an avid reader of science fiction and fantasy, I’ve become convinced that there is a power and force within these stories that is very hard to find in today’s world. This is a short update on what is going on in my own life as well as an energy update. I’ve really been feeling the energy squeeze and it has not been comfortable. But what’s new with that? A lot of my energy has gone to simply surviving and keeping up with Gaia’s ascension energies. Let’s begin with that. After almost an entire life of astral battles and a life of difficulty/going against the grain, I’m having more and more lucid dreams/visions of friendly greetings with people, shaking hands and working together. Obviously something is collectively coming together that my dream self supports. The polarity of the energy has changed from oppositional to supportive. That has to be good in terms of manifesting things right? So I missed my plane ride, my ascension plane left without me, as I have suspected for a long time and I’m here for one more great cycle. Maybe I care, but no one else does! Chuckle. Goodbye light workers, hello new elves! What’s up? Well for one thing the Unity thing is a done deal. Gaia and all living things upon her have united in giving us a brand new world with new laws and new ways of manifesting. It has been a collective effort of immense magnitude and now its done! It’s time for things to go the other way. Expect the opposite of the New World Order for a very long time. Expect grass roots self-sustaining and activism take on entirely new meanings as the only way to achieve meaningful results. Expect a resurgence of state’s rights, county programs and townships and cities getting into this. Individual empowerment is on the rise. To bad we don’t know what that means. Our society is deathly afraid of internal authority, people acting on their own empowerment. The message we have received is listen to the experts, obey the authorities, they know what is best for us. Well, this is in the process of collapse. The new paradigm is about the empowered individual living in a free world, in cooperation with all other living things. It is not about control, but about adaptation. It is not about having control over others, but about being allowed to be the most each one of us can be! The sad reality is that the majority of the population do not want empowerment or freedom, they want hand outs and they don’t want to experience the consequences of their own behaviors. Free rides, free rides! Well, there are no more free rides! It is a level playing field right now. Those in poverty have just as much chance of success as those in positions of power. The neighbors cat or the rabbit in the garden has just as much chance of success as we do! This single fact must be brought home to the attention of everyone. The new laws of physical manifestation involves a process that makes use of personal effort expended during each day. It is no longer possible to get ahead by usurping the efforts and energies of others. That is no longer supported. It is no longer possible to skate. That is no longer supported. You can get ahead through personal effort or you can be left behind through your own lack of effort. Those that become slaves will become slaves because they refuse independent empowerment. Not because others seek power over them. They will simply miss the boat and keep missing it. But the opportunity will always be there for them. This is a damning statement that has finally come to haunt us. There are too many people that simply don’t want to be here! They want to be in some heaven or spiritual plane so they poison this one. The worst harm has come from the separation of human sexuality and spirituality. Human sexuality is the most powerful of spiritual experiences and the most rapid way to develop the soul itself. The martial artists speak of developing the “immortal physical body”, one that lives forever at the etheric level. But after it is developed one must drop the current physical body! What is going on here? Again the goal is to leave physical life, not to embrace it. But at least this time there is some honesty. You develop the “immortal physical body” or “soul” through intense physical effort and through cultivating sexual force or power. The “soul’ is an extrusion of the physical body released through stress. But we are here in physical bodies and by developing our “soul” we can affect change in the non-physical planes to influence our lives. We can do “magick”. Make no mistake, the world of physical life and physical manifestation is and will always be “bitter-sweet”. But we can achieve the life experiences we desire through personal effort. Now, more than ever before. The “Soul” requires a physical body, and the physical body requires a “Soul”. Together they form an immense resonant circuit. A million years from now our souls will still require physical bodies. We have been taught the great lie that our “soul” can exist in “heaven” forever if we have ascended or been saved. The reality is that our soul will gradually over the course of time slowly fade into nothingness unless it regenerates itself by physical incarnation. This fading into nothingness has been termed “returning to the light” and “returning to Source”. So the real question at hand is: Does God/dess want us to exist as co-creators or does He/She desire us to perish? My answer: Let those that want to be co-creators become co-creators and let those that desire to perish extinguish themselves in the light of unity. But don’t let them poison our world of precious life! Call a spade a spade! Call Anti-life what it is and don’t call self-extinction spiritual!